Microsoft is migrating several functions formerly reserved for its Xbox One SmartGlass mobile app into the Xbox app for Windows 10, as it increasingly ties the Xbox One console to PCs and mobile devices. Microsoft didn’t really add anything too new to the Xbox app for Windows 10, which might be thought of as a private social network for gamers on the Xbox One, and soon Windows 10. But the capabilities of the Xbox One SmartGlass app on Windows Phone and the Xbox app on Windows 10 are now largely identical—which makes a great deal of sense to those who might not own a Windows phone, but who may eventually run Windows 10 on, say, a Surface tablet. SmartGlass is a “second screen” app that was originally written for Windows Phone, allowing it, for example, to control aspects of a connected Xbox One. Like SmartGlass on the phone, a Microsoft spokeswoman said in an email, users can navigate the Xbox console. They can also bring up the OneGuide channel guide, find TV listings and app channels, then instruct the console to tune to the selected content. The app can also be used to mute the television and adjust the volume, similar to the virtual remote control apps that are available for various smartphone platforms. 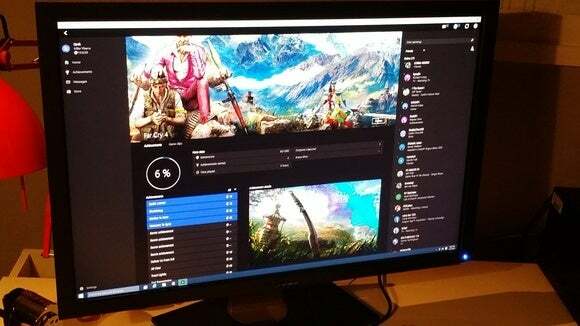 “Additional SmartGlass functionality, TV streaming and game streaming will be coming in future updates to the Xbox App on Windows 10,” the spokeswoman added. The most interesting aspect, of course, will be the game streaming from the PC to the Xbox One that Microsoft will add later this year. The company has also said it’s considering streaming in the opposite direction, from the One to the PC, to take on competing technologies from Nvidia and Valve. Microsoft originally designed the Xbox One as a console that could run Windows apps like Internet Explorer. Throughout the past year, the company has gone further by describing a common interface—if not common apps—that could run on phones, PCs, and the Xbox. The Xbox One’s March update also allows you to make public your real name, as well as your Xbox gamertag, providing a comprehensive public identity to those who want to divulge that information. Why this matters: There are two things going on here. Microsoft is slowly helping to make the Xbox One an extension of the PC, and vice versa. The app integration helps fuse the two together. But there was also a sense that SmartGlass would be an “exclusive,” if you will, to Windows Phone. Is this a recognition that that tech won’t sell Windows Phones? Or is Microsoft paving the way toward the sort of universal apps that will characterize Windows 10? We don’t know.